Ready to get the post-snow salt and grime off your car? Flagstop Car Wash is offering $3 off Express Washes (which start at $5) with code 90305. Enter the code at the autocashier at the entrance to the wash while you are paying. Valid through 4/6/13 at the Parham Road, Staples Mill, and Chester locations. Two bucks is a great deal, especially since it comes with free use of the vacuums. 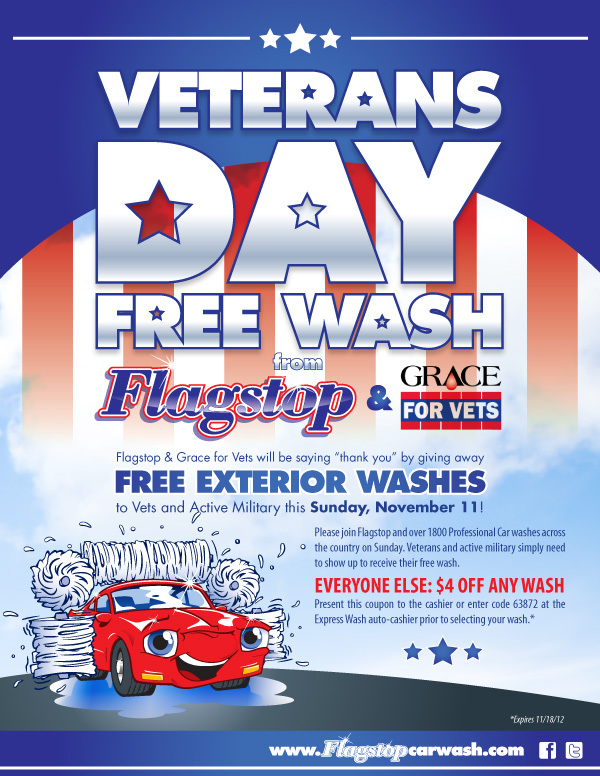 Flagstop Car Wash – Veterans and Active Military can Enjoy a FREE CAR WASH on Sunday, November 11 Also, everyone else can save $4 on any car wash with coupon code 63872. The express wash is only $5, which *should* make it $1 after coupon! Update: Car Pool Car Wash also offering a free wash to veterans on Sunday! Chick-fil-A at Short Pump Crossing – To honor our Veterans, this Monday, 11/12/12 Chick-fil-A @ Short Pump Crossing is showing their support by offering a free chicken sandwich combo meal to all active & retired military veterans from 8am-8pm. Please show ID to redeem. We are offering the Chicken biscuit meal if you visit between 8-10:30am during our breakfast hours. Update: Chick-fil-A Chesterfield Towne Center – Happy Veterans Day! Tomorrow, Monday the 12th, we will be offering a Free Chick-fil-A Sandwich to all Military Veterans & Active Personnel. No purchase necessary, we’re able to be open for business because of your sacrifices. Whole Foods – Friday One Day Sale is cherries for $1.99/lb (Reg $4.99/lb). While supplies last. Receive a coupon for a free car wash when you register for Flagstop Car Wash e-Club. It may take a couple of days for your coupon to be emailed.